For the longest time, the words 'new from Leica' sounded like an oxymoron, but on 9/9/09, Leica's Chief Executive Officer Rudi Spiller, along with Director of Product Management Stefan Daniel and the musician/photographer Seal, announced the introduction of 2 new Leica rangefinder cameras – the Leica M9 and Leica X1 - along with the official debut of the medium-format Leica S2. And they were able to make these announcements with straight faces and without chuckles from the audience. Sarcasm aside, these are truly heady days for Leica and long-time Leica aficionados around the world. 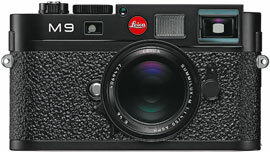 The Leica M9 is the first full-frame (24x36mm) digital rangefinder camera. Bearing an uncanny resemblance to the Leica M3, which was introduced 55 years ago, the M9 is pure Leica in every sense of the word. The heart of the M9 is an 18Mp CCD imaging sensor, designed by Kodak to meet the technical demands of shoe-horning a full-frame imaging sensor into the confines of a rangefinder body, while maintaining edge-to-edge sharpness and minimal fall-off towards the edges of the frame. And based on the large-format prints on display at the press conference, everybody involved in this project did their homework and did it well. The M9's imaging sensor features a newly-designed glass UV/IR absorption filter that resides in front of the sensor, which eliminates the need to filter the camera lens as required on Leica's M8 and M8.2. To further improve image quality, Leica's engineers eliminated the need for an anti-moiré filter by removing random moiré patterns post-capture, using the camera's signal processing software. By eliminating the anti-moiré filter from the image light path, Leica's engineers were able to take better advantage of the imaging sensor's resolving power. Edge sharpness, the Achilles heel of full-frame digital imaging, was addressed in the M9 by carefully angling microlenses attached to each pixel towards the center of the frame, with increasing angles towards the edges of the imaging sensor to better maintain uniform sharpness across the image plane. All current Leica M-series lenses, ranging from 16 to 135mm, work with the M9 and deliver the same image area as film-based M-series cameras. Most all earlier M-series optics dating back to 1954 can also be used with the M9, and for a small fee can be updated with 6-bit coding which, aside from allowing the M9 to compensate for vignetting based on the focal length of the lens, enables full communication between the M9 and older lenses. Like earlier M cameras, the M9 body is machined from a 1-piece magnesium-alloy body and solid brass top and bottom plates. And like earlier M-cameras, the M9 is hand-crafted every step of the way. According to Leica, it takes approximately 60 hours to manufacture an M-series camera. The M9's microprocessor-controlled shutter is quieter than the shutter used in the M8, and goes up to 1/4000th-second (flash sync is 1/180th). Sensitivity levels go from ISO 160 (expandable to ISO 80) through ISO 2500. Aside from the analog shutter speed dial located on the teutonically sparse top plate, all other controls are located on the back of the camera in the form of easy-to-decipher buttons and menus which come up neatly and legibly on the camera's 2.5" LCD. TTL light readings are established by reading light reflected off the 3 middle horizontal shutter blades, which are painted in neutral shades of gray. An RGB histogram, along with highlight and shadow clipping warnings, can also be displayed on the camera's LCD for further control of image quality. The Leica M9 can capture up to 2 frames-per-second and can record image files as JPEG, RAW (DNG), or a combination of both. Images are recorded onto SD cards, which are located alongside the camera's rechargeable battery under the camera's removable bottom plate. Talk about a very cool camera. The Leica X1 is a real-deal compact digicam that affords DSLR image quality in a camera body not much larger than the average point-and-shoot camera. Made in Germany alongside the M9, the X1 bears an undeniable resemblance to its elder sibling, and is a wonderful alternative for photo enthusiasts who can't justify the bucks for a Leica M9, as well as those who can afford an M9, but want a smaller, Leica-quality camera for lighter-weight (about 10 oz) daytripping needs. What makes the X1 especially tasty is the 12.2Mp APS-C format CMOS sensor that lies within the camera's svelte body, making it an ideal camera for those seeking maximum resolving power in the smallest of packages. The X1 is complimented by a fixed, 24/2.8 Leica ELMARIT ASPH lens which, with an angle-of-view of a 36mm lens on a full-frame DSLR (about 62°), should endear the X1 to many dyed-in-the-wool Leica enthusiasts. ISO sensitivity ratings go from 100 to 3200, and there's an Auto mode that automatically adjusts ISO sensitivity levels in relation to the ambient light levels. Shutter speeds can be adjusted from 30-seconds through 1/2000th-second, and you have the choice of shooting in Program, Aperture Priority, Shutter Priority, and Manual. Like the M9, the X1 has an all-metal body which, despite the camera's small size affords it a solid, no-nonsense feel. The top deck has analog dials for setting shutter speeds, capture mode (single frame or continuous), and a thumb-driven manual focus ring. The X1 has a Live View-enabled 2.7" LCD which, when working in manual focus mode, displays a 10x magnification of the central portion of the image field for fine focusing. As an alternative to using the camera's LCD for composing and shooting images, Leica offers an optional 36mm optical finder that slips onto the camera's hotshoe, which transforms the X1 into a stealthy street-shooting machine. To eliminate the doubt factor when using the optical finder, a tiny green LED positioned just below the hotshoe lights up when the image is in focus (in AF mode) and blinks if the image is not in focus. When using the optical finder, you also have the option of turning the LCD off, which in turn extends the battery life. Like the M9, theX1 can capture images as JPEGs, RAW (DNG), or a combination of the two, and stores images onto SD/SDHC memory cards. And 'just in case', the X1 contains about 50Mb of internal memory. First unveiled about a year ago, the Leica S2 will be arriving for sale at B&H before the close of 2009, and, I for one, can't wait to snag one for a spin around the block. Slightly stockier, but not any larger than any of the pro-oriented, 35mm-based DSLRs, the Leica S2 is a medium-format DSLR designed for use by the most discriminating pro shooters. More than a blatantly excessive hunk of photo-bling, the S2 is weatherproof, dustproof, and designed to capture images with clarity far beyond medium-format film cameras. Aside from the white Leica nameplate and red Leica badge, the design of the black-bodied S2 is simple and austere. A silver shutter release and black analog shutter-speed dial located on the upper deck are among the few visible exposure controls, and all other control buttons and dials are equally subdued. The imaging sensor inside the S2 is a Kodak-designed 37.5Mp CCD, which is 54% larger (30x45mm) than imaging sensors found in 35mm-based full-frame DSLRs (approx 24x36mm). Featuring 16-bit color and a dynamic range of about 12-stops, the quality of the 75MB (DNG) image files produced by the S2 are, for lack of better words, hype-free amazing. As a means of squeezing the most resolving power from the sensor, Leica's engineers eliminated the low-pass filter typically found on imaging sensors and instead are relying on the camera's internal signal processing to eliminate any moiré patterns that might detract from the final image. A high-speed MAESTRO image processor enables continuous shooting at 1.5 fps at maximum resolution, and for low-light shooting, the ISO sensitivity rating of the S2 can be pushed to a noise-suppressed ISO 1250. Images can be captured as JPEG (a first for medium-format digital imaging) as well as RAW (DNG). The S2 features dual memory card slots – CompactFlash (CF) and SD, and the camera can be programmed to record RAW (DNG) files to the CF card while simultaneously recording JPEGs to the SD card. And for studio shooters, an HDMI interface allows for immediate viewing of images on your monitor, TV, or via LCD projector. The S2's metal focal-plane shutter tops out at 1/4000th-second and has a top sync speed of 1/125th. For studio shooters and others requiring faster sync speeds for flash, Leica will be offering a line of S-series optics in several focal lengths containing integrated leaf shutters that will enable sync speeds up to 1/500th-second. For playback and editing of images, the S2 has a bright 3" TFT LCD (460,000-dots). In addition to the standard LCD configuration, the S2 is also available, at extra cost, with a highly scratch-resistant Sapphire glass display, a.k.a. 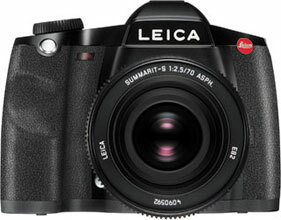 the Leica S2-P. In addition to the aforementioned leaf-shutter lenses, Leica has a tidy line-up of S-series optics to go along with the new camera. Included in the initial line-up is a 'normal' SUMMARIT-S 70mm F/2.5 ASPH, as well as a SUMMARIT-S 35mm F/2.5 ASPH, APO-MACRO-SUMMARIT-S 120mm F/2.5, and APO-TELE-ELMAR-S F/180mm, with more to follow. 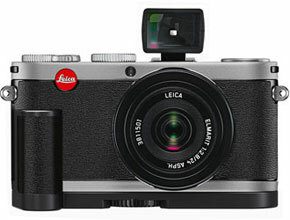 As they become available we plan on road-testing these new Leica products, so stay tuned.